Tech companies like Samsung and Apple have put significant resources into developing smartwatches. But high-end fashion brands think they can do better. 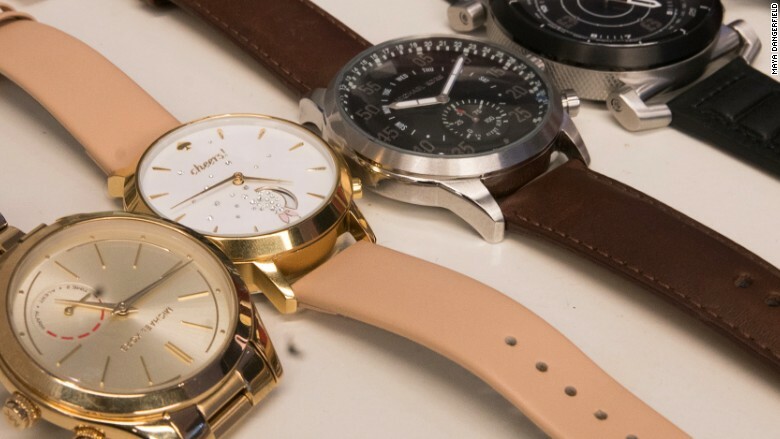 On Tuesday, Fossil Group (FOSL) launched more than 40 new smartwatch hybrids across its accessory brands like Emporio Armani, Kate Spade (KATE) New York, Michael Kors (KORS), Diesel and Chaps. The devices look and feel like traditional analog watches -- you'd never know they count your steps, monitor your sleep and push notifications to your wrist. That's because hybrids don't have typical smartwatch displays; instead, you'll need to open an app to see activity data. According to Jill Elliot, chief creative officer at Fossil, all of the company's watches will have some form of smart capabilities in the near future. "We know technology is a major disruptor in many industries right now -- even fashion," Elliot said. "But to successfully merge the two, we need to have the fashion design expertise and focus on it first." A look at the Fossil hyrbid smartwatch collection. The collections are more attractive than most smartwatches, which are often heavy and clunky due to a built-in computer processor. The Fossil hybrids use a coin-cell battery that lasts six months -- compared to the Apple Watch, which needs a recharge each night. This lets Fossil's brands keep it simple. When someone calls or texts, the watches vibrate, indicating it's time to check your phone. You can also program the watch hands to move to any number when a certain person calls (i.e. both hands can move to the one if a parent or spouse is calling). Each brand's app and functionality is a bit different. For example, Kate Spade's includes a countdown feature. A user can program it to count down to something fun, whether it's a vacation or meeting a daily activity goal. Progress is shown via a small champagne glass on the watch face. "We assess all tech partnerships through three lenses: Does it deliver on our customer-centric brand promise? Is it convenient for our customer? And does it complement our customer's interesting life?" Mary Beech, executive vice president and chief marketing officer for Kate Spade, told CNNMoney. "We don't introduce technology for technology's sake." 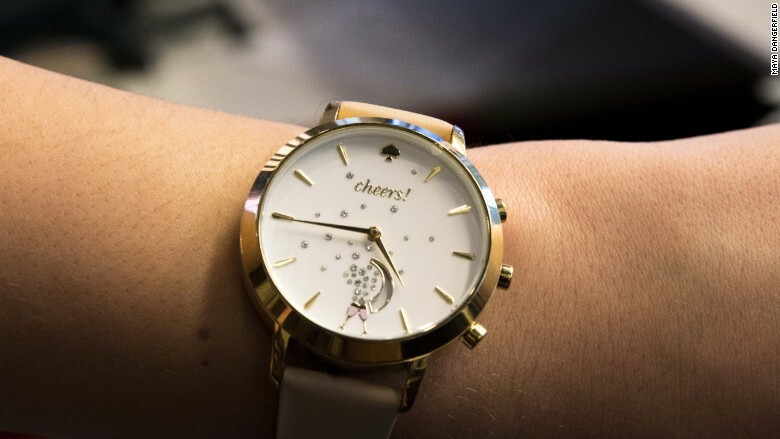 The Kate Spade hybrid smartwatch. In May 2015, Kate Spade introduced a handbag with a built-in iPhone charger. Earlier this year, it welcomed a fitness tracker bracelet. Meanwhile, Emporio Armani's new hybrid watches embrace a sleek minimalist aesthetic and let you control music directly via the device. Watch makers have worried for years that smartphones might replace traditional timepieces. But the tech wearables market is projected to hit $34 billion by 2020, so it makes sense that Fossil -- as well as other iconic watch companies like TAG Heuer and Timex -- would want a larger slice of the pie. The new hybrid smartwatches will appear in stores soon, positioned next to traditional analog watches. Prices range from $160 for the Chaps hybrid smartwatch to $395 for Armani's connection edition. Earlier this year, Fossil announced it would introduce 100 wearables in 2016. The latest effort puts the company well over its target with 143. In addition to hyrbid smartwatches, the parent company has cranked out display smartwatches and activity trackers in previous months. Fossil said it's pleased with how consumers are adopting the devices so far. "Sales of wearables have been very strong since we launched [connected accessories] in late 2015," said Elliot. While he declined to comment on specific numbers, Anderson said the flagship brand's Fossil's Q Founder smartwatch was its bestselling watch from its 2015 holiday lineup. "Over half of the purchasers of Fossil Q were new customers, confirming consumers were looking for a smarter watch designed with their personal style in mind," she said. While the wearables industry is still looking for footing, the debut of hybrid smartwatches from eight of the world's most recognizable fashion brands hints at the future of watchmaking -- and how tech brands have much more competition ahead.